Last year, I decided to build a table. This year I decided to sew a quilt. Christmas is a time for big project dreams in 350 square feet apartments, like mine! 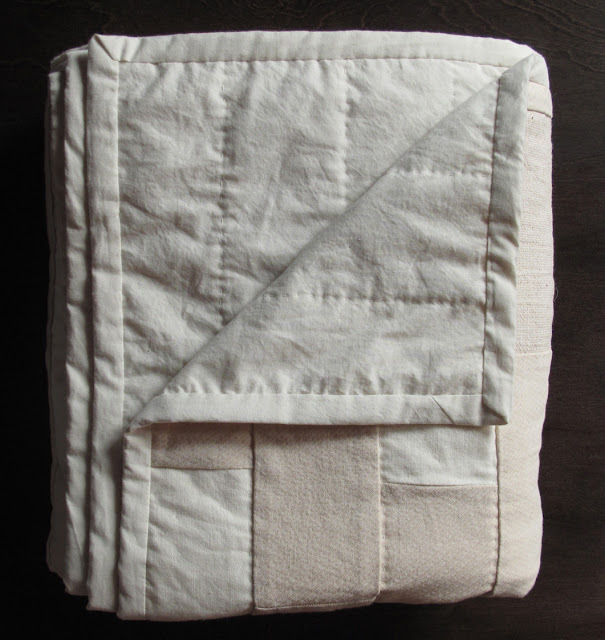 In the time it took to write about this quilt, I could have made another, for each of you. Read more to see the glorious details of how to make an American quilt. I haven't taken any instruction in quilting, never owned a quilt, but with the library and internet by my side (and years of sewing under my belt) I felt this was something I could certainly tackle. This is everything I know. This quilt is for a guy. With a beard. It had to be as modern and manly as a quilt can get. I chose a subway tile size patch, 3" x 6", and designed a shifting pattern. It was important to me that the materials be American. I found organic American grown and woven fabric here, at Near Sea Naturals. The fabric is all unbleached, un-dyed cotton but cotton occurs naturally in a few different shades and are offered in different weaves so you've got more design options than you might imagine. I made a sketch of my design, to scale, on graph paper. I wanted the quilt to be larger than the top of a full sized bed so I sketched its dimensions on top of the design as well. Counting patches and adding a quarter-inch seam allowance to each side of the patch, I got estimates of the quantity of fabric I would need. I ordered the fabric I needed for the patchwork, thread and fabric for the back of the quilt - the company offers some fabrics on 110" bolts, perfect for the backing. You'll also need enough fabric to make your binding. I estimated prayed that the extra fabric from the backing piece would be enough. The fabric arrived. And I waited about 6 months to get started. Once Christmas was panic-close, I got started, said good-bye to my friends and hello to DVDs and Hulu. I have a 36" cutting mat, rotary blade and t-square; they made cutting the patches a breeze. I'm big on pressing, pressing, and pressing and that I did to get each piece of fabric folded and pressed to fit on my mat. I then cut the rows, 3.5" and then cut the tiles at 6.5". I kept count of how many tiles I was getting for each fabric. Due to some jagged edges on the fabric I received I didn't get as many tiles as my original sketch had required so I modified the size to be as large as it could be with the tiles I had. Once all of my patches were cut I began to create stacks for the rows. Not wanting to mess this up, I was overly organized (the only time in my life) and numbered the rows on my sketch and created corresponding tags for each stack of row patches I was creating. Then the patching began. It is essential to chain stitch the patchwork, you'll never finish otherwise, I'm sure of it. Right sides together, put two patches together and stitch as normal. When you get to the end, stitch a few stitches past the raw edge and line up your next pair of patches. Begin stitching again and feed in this next pair, never lifting the foot or cutting the thread. When you get to the end of the stack for that row, lift the foot, cut the thread and then cut the thread between each pair of patches. Now repeat this to stitch each pair together - be sure to let the seam fall to one side of the patch (the darker patch) instead of keeping the seam open (**Note, they are shown open in the photo below, I did this for the first few rows before I decided to switch. If you are machine stitching it is less of a problem, if it you are hand stitching then you are adding another layer of fabric to sew through). Then repeat it for each patch on each row, with a smile on your face. This part, still near the beginning of the process, felt rather quick to me and thought, "this quilt will be done in no time!" Next piece your rows together. Right sides together two two at a time like you did the patches, again letting the seams go to one side instead of pressing open (you'll need to decide which side you'll be quilting on and always leave this row free of seams). When your pairs of rows are done, start stitching the pairs together until your entire top patchwork is complete! Whew! During this time I was steam pressing my seams and my tiles (love it!). I later read that some quilters do not recommend using steam as it can warp the fabric, I definitely feel this happened to me and on the next go around I'll forgo the steam. Once your quilt sandwich is in place, begin basting. If you're going to machine quilt it's best to use quilters pins (safety pins with a bent arm). If you're hand quilting it's best to hand baste (long stitches made with a curved needle in the same spiral pattern that you'd pin); this way no pins get stuck between the pieces of your quilting hoop. I hand quilted but used pins, it's not too big of a problem, you can just remove a pin if it's in the way of your hoop. Starting from the center, place pins in a spiral until the entire quilt is covered. Make sure you are going through all three layers. I was terrified that I'd turn my quilt over and find I'd missed all the layers so I stuck my pin down until I felt it prick my floor (sorry, landlord!) then turned it back up to the top. When the basting is finished, take your scissors and cut away the excess backing and batting - leaving a two inch or so buffer from the edge of the patchwork. Beeswax - important when using cotton thread on cotton fabrics and batting; keeps it from pulling the batting out along with the thread. Thimbles - of all shapes and sizes. I used many kinds, but found the most success with a metal thimble on my right index finger and letting my left index finger get continually pricked so that it formed a callus, perfect for quilting and feeling less pain, plus people will really feel for you. There exists a metal under-thimble, available here, which I'm sure would have been perfect for my poor left index finger but I could not find it locally and there was no time to order. I went back and forth with a leather and metal thimble on my right thumb, but mostly didn't use anything, I found them to be too cumbersome. I would have liked to have found a rubber thimble for my thumb. This bowl of tools became my companion, as well as a cup of tea (placed dangerously close to quilt) and TV shows on the internet. Starting from the middle, place your hoop on your quilt. Pick a starting point. I 'stitched in the ditch' of the lighter rows of patches where the seams did not fall (stitching on the other would add 2 more layers of fabric to go through!). Cut approx. 18" of thread (otherwise the thread will get weak going through so many holes so often and it will be too long to comfortably pull out with the length of your arm). Put a quilter's knot at the end of your thread. Place your needle into first and middle layers of quilt sandwich, and pull it out in the location you want to make your first stitch. When you get to the knot give a slight tug to the thread to pop the knot inside the layers of fabric. Make your stitches using the 'rocking' technique. Stick the needle straight down through all layers of fabric until it touches your left index finger, at which point you press it back up (not having let it come very far out of the back fabric, this is your stitch length) through the layers and meet it with your thumb on the top (again, don't let it come very far out, this is your stitch length and the smaller, more consistent, the better). With your right index finger 'rock' the needle back down and repeat until you have three or four stitches on your needle. Pull the needle through the stitches and repeat. When you've come to the end of your thread, place the needle on the surface of the fabric, near where you just came out. 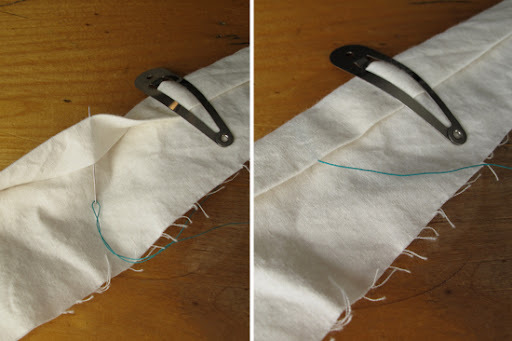 Wrap the thread around it twice, tightly and use your thumb to hold it in place. Pull the needle through and you should end up with a knot not far from the surface of the fabric. Put the needle back into, as closely as possible, the hole you last came out of and gently tug it until the knot pops into the fabric as you did when you began. Take out any pins you no longer need (as they become surrounded by quilting) and move the hoop along as you make your way around the quilt. When you're finished quilting, (What a moment! Have you had a g&t yet? Do so.) it's time to square the quilt. Using a clear quilting ruler or t-sqaure, trim off the edges of the batting and backing and square up the sides of the quilt. Measure the perimeter of your quilt. This is how much binding you will need to make, but give yourself some extra (what's another 12" at this point?). If you're like me you'll make a few different samples to see just how wide your binding should be. Should it be half and inch or three quarters? Ooh, tough call. I cut strips of fabric 2.5" wide until I had a bit more than my perimeter. You'll probably have to piece together a few strips to get the length you need. 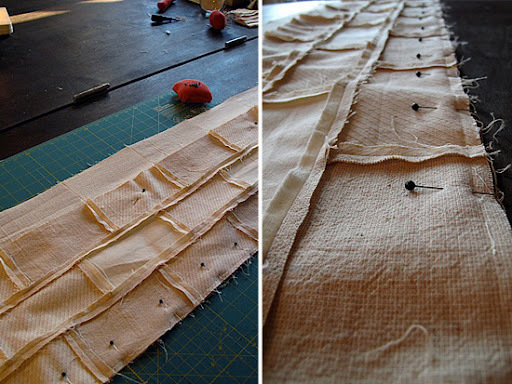 To piece binding strips together, take two ends, place them perpendicularly to each other. With the overlap square on the right and the strips to the left and bottom - stitch from top-left corner to bottom-right corner (of the overlap square). You should press these seams open (the greatest distribution of weight). Now take your forever long strip, fold in half lengthwise and press (**Note: in the photo I did the pressing then the piecing, both work but for beginners it's probably best to piece first). Open the strip back up and fold each raw edge in towards the middle, stopping just shy of the crease, and press. Re-press the half fold. You can also use a binding tool to make this process easier, but you're limited to the sizes available, none of which were the size I wanted. When you're finished, open up the binding, lay flat, right-side down, along the edge of the quilt and pin. Starting about 2 inches from the beginning of the strip, stitch along the nearest crease. Stop about a half inch from the corner. Take the quilt from the machine and position the fabric so that the strip running top to bottom folds over the left-to-right strip in such a way that the fold is flush with the raw edge of the quilt. There should be a fold of a triangle underneath. Pin this down and stitch from the edge down to about half an inch from the next corner and repeat for each corner. When you are almost to the end, fold the 2 inches you skipped at the beginning in and place the end of the binding on top, making a raw-edge free join. Finish stitching the end over the top of the folded beginning. Now, we get back to the hand part. Fold your binding in towards the middle crease, then wrap around the raw edge on to the back of the fabric. Hold in place with binding clips and hand stitch the binding on with a blind stitch, again in 18" increments of thread. Start by having the needle come out from the inside of the binding, as shown in the photo above. Then, with medium-sized stitches, go into the backing fabric (but not through to the patchwork top) just under where the binding will fall on the backing. This way this stitch can be neatly covered by binding. Then take the needle through the fold in the biding and back out to the backing fabric. Repeat and repeat. When you get to the corners you'll find they miter nicely. When you're done...you're done. A quilt! I do believe this post took about as long to write as it did to make quilt. I hope many find it helpful and I hope it helps nudge someone to finally make a quilt. I promise it is so much more satisfying than you can imagine. You two are both so amazing. Thanks for sharing! wow, great detail on how to create this amazing quilt-gift. it looks like a really involved process. you wanna make me one this weekend? 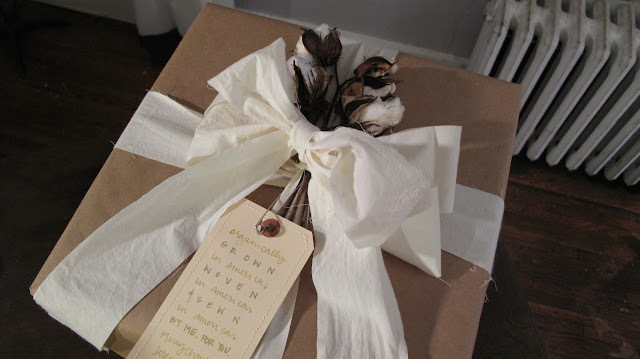 Also - I just found your blog via Casey's Elegant Musings and I'm hooked! Thanks! Good luck with your quilt endeavors! I am glad that my first project had a bit larger tiles, but now I'm eyeing some more detailed quilt projects like a cathedral window quilt - and that's gonna take a lot to get me to make a first move! I love your creamy quilt ! Your tutorial is brilliant .... but I'm still very glad that my quilts are usually 7" x 8" .There's a lot to be said for thinking small ! I looked at a lot of websites and got a lot of information from here and from there and wanted to share my experience and put all that I had learned in one place! hello! I've just read thru your entire post and am completely amazed. I am so impressed that you documented it all and created a tutorial just for us scuzzy bottom feeders who want to emulate your success!! I know how long it takes to make tutorials, and yours is so incredibly complete and beautiful. Thank you! Now.... is this a project a never before quilter can truly accomplish? I've thought about quilting for ages, but am quite terrified to do so without a network of support! About how long would you say it took you? Anywho, Thanks a million and congrats on making such a beautiful finished project. The internet is totally for sharing and if it wasn't for all the bits and pieces shared elsewhere I wouldn't have been able to pull this off and share it myself! I was a never before quilter before this! So, yes, you can do this! Really, you can! It took me about a month, and that's fairly short but I procrastinated and had to really go all out. That month included most of my evenings after work, and many 8 hour at a time stents on weekends. And sometimes I would get so into the routine of it and see the end of a step fairly near and work until the wee, wee hours of the morning. So, at a more normal pace it may take twice as long, really it depends on how much time you can carve out for it. I want to now! Can i trouble you for information regarding the finished size and how much fabric you ordered? I checked out that site and they have beautiful fabric, however did you choose!? I'm looking back over all of my notes and sketches and I believe my final measurement was 60"x82" and the perimeter (for making the binding) was 284". A full sized mattress is 54"x74" so it's a little larger than that. This was my fabric order (the last number is the price and the number before that is the quantity). And like I said in the post, because the cuts weren't exactly square I wasn't able to use it edge to edge like I had originally calculated for. I have a bit left over, but it's really just scraps. The most of anything that I had left over was batting. Hope that helps, I'm glad you're excited!